Anna contacted us a couple of weeks ago in regards to building a website for their taxi business. During discussions, she also mentioned they had another website that was setup to sell a book that her husband created, The Dawkins Delusion Exposed. They had another web designer create the website several years ago – but the payment integration never worked. When someone chose to purchase the eBook, they could pay via PayPal but they never received the downloaded copy. In addition, when someone chose to try and purchase a paperback copy, it didn’t work at all. Before Anna had us start on the taxi site (since they are still getting their information together), they wanted me to fix the PayPal integration issues with that site. Now when someone purchases the eBook, they will get an e-mail upon payment that has the eBook attached. In addition, the payment for the paperback was also fixed so that it pays Anna whenever it is purchased. We appreciate the business from Anna and look forawrd to making her taxi website soon! 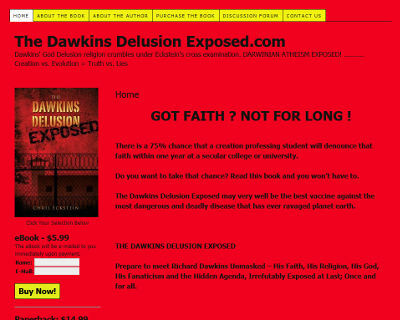 The website for the book is at thedawkinsdelusionexposed.com.